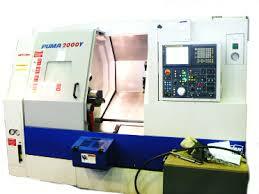 The Puma 2000Y is a more sophisticated CNC lathe with FANUC control, as has a built- motorized Y axis for milling work tool. The maximum size of piece is covering tubeless steering wheels Ø330 x 500 mm and a bar passage Ø65 mm. The winch incorporates an automatic bar feeder for conducting long series.